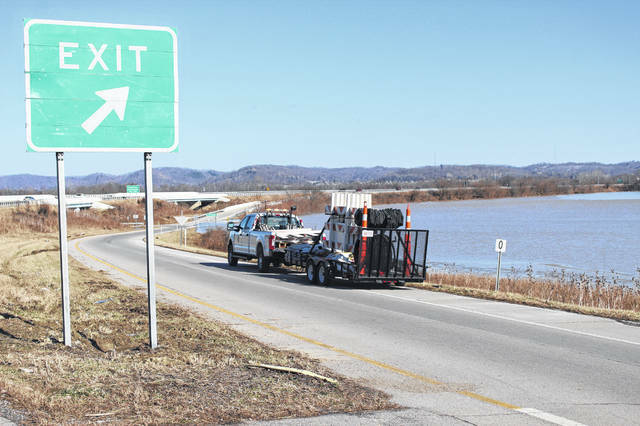 Workers with the Ohio Department of Transportation began closing the exit to West Portsmouth off US 52 East Friday afternoon as the Scioto River continued to rise. The Scioto County Emergency Management Agency (SCEMA) has issued a flood warning for portions of the Scioto River near Piketon. According to SCEMA, the river was to reach above flood stage early Friday morning and continue to rise to near 21.3 feet by early Saturday morning. Flood stage for the Scioto near Piketon is 20 feet. According to SCEMA, at stages near 21 feet, several roads near the river are flooded, including county roads along creeks emptying into the Scioto River. As of Thursday night, SCEMA said Ohio route 220 River Road was flooded south of Waverly. Officials added Scioto and Camp Creek townships in southern Pike County are most impacted. According to Ohio Dept. of Transportation spokesperson Kathleen Fuller, the Scioto already was causing problems Friday afternoon. About 1 1/2 miles of State Route 239 in West Portsmouth between U.S. 52 and SR 73 was closed Friday. Additionally, a portion of SR 73, essentially leading into downtown Portsmouth, also had been closed that afternoon. “We don’t anticipate any further closings during the weekend,” Fuller said, though she added the weather situation and the road conditions are always changeable. Fuller also stated the closed routes probably won’t be reopened until Monday. She said it’s just not a matter of the water receding and ODOT removing barricades. Flooding usually leaves behind lots of silt and debris, such as tree limbs and trash, which, of course, crews must remove before streets can be opened to traffic. According to Fuller, the obvious detour in the case of both closed roads is U.S. 52. At the time the flood warning was issued, SCEMA noted no current observed data was available. According to the website of the National Weather Service office in Wilmington, which serves south-central Ohio, the last observed measurement for the Scioto River at Piketon was a mere 11.8 feet at 2 a.m. Tuesday. The weather service hydro-logical forecast shows the river peaking at about 21 feet Friday into Saturday. The forecasted levels begin to drop off precipitously beginning Saturday, plunging all the way to 9.7 feet, far below flood stage by Wednesday, the last day for which a forecast was available on Friday. Historically, the Scioto at Piketon reached an all-time high of 37.2 feet way back in March 1913. The most recent high mark was reached in January 2005 when the Scioto crested at 28.4 feet, the seventh highest level on record. While SCEMA voiced concerns about the Scioto River, no flood warning was given for any part its larger neighbor, the Ohio River. Turning again to the National Weather Service, their forecast shows the Ohio River at Portsmouth reaching a peak of 45.6 feet very early Sunday morning. That number is still well below the Ohio River’s flood stage of 50 feet. After Sunday, weather service predictions show the Ohio River dropping quickly to a low of 32.5 feet by Wednesday, again the last day forecast as of Friday. Setting aside any flood concerns, residents around the area can probably count on one thing over the next few days: it’s going to be cold. According to SCEMA, a strong cold front will blast into the region Monday night into Tuesday, bringing a nice bit of Arctic air. Low temperatures in the single digits are expected Tuesday night, with below zero temperatures possible Wednesday night. The Arctic blast is expected to affect northeast Kentucky, northern Kentucky and south-central Ohio. 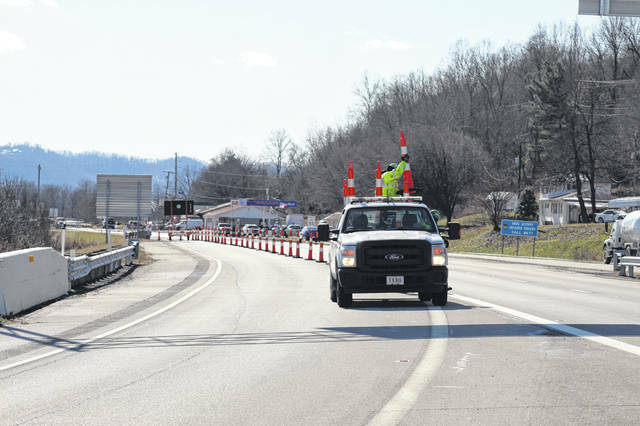 https://www.portsmouth-dailytimes.com/wp-content/uploads/sites/28/2019/01/web1_Road-closed.jpgWorkers with the Ohio Department of Transportation began closing the exit to West Portsmouth off US 52 East Friday afternoon as the Scioto River continued to rise.